Earlier this week I shared some insights on casual dining options from my recent visit to Las Vegas. Today I want to continue on the topic of food (because that's kind of my thing) and tell you about two fantastic upscale dining experiences from my trip. If you're looking for great food, amazing service, or to celebrate a special occasion, these are two restaurants to definitely keep in mind. Located in what is commonly known as 'Restaurant Row' at The Venteian, AquaKnox is one of Vegas's premier destinations for seafood. To ensure that they are serving the highest quality dishes, fresh seafood is flown in detail to be prepared in the AquaKnox kitchen. Known for their "global water cuisine," the AquaKnox menu features inventive twists on classic regional seafood dishes. 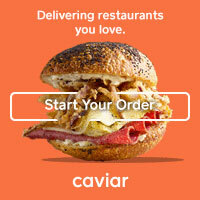 The restaurant is sleek and modern with a huge fishtank and a raw bar situated front and center. I had the privilege of dining here during the first night of my conference and even the banquet menu (which is a slight variation on their traditional menu offerings) was really amazing. We started the meal with a simple salad of mixed greens and herbs with a light and flavorful champagne vinaigrette. We had a few choices for entrees, but I knew that seafood was the was to go here. I decided on the prawns. They were huge and perfectly grilled, served in a flavorful herbed butter sauce. They were simple, but expertly prepared. In addition, we shared a few side dishes like the super rich and creamy mashed potatoes, crisp grilled asparagus, and this garlicky assortment of sauteed mushrooms that so tasty and a favorite dish at my table. To finish things off, we each enjoyed a slice of banana cream pie. 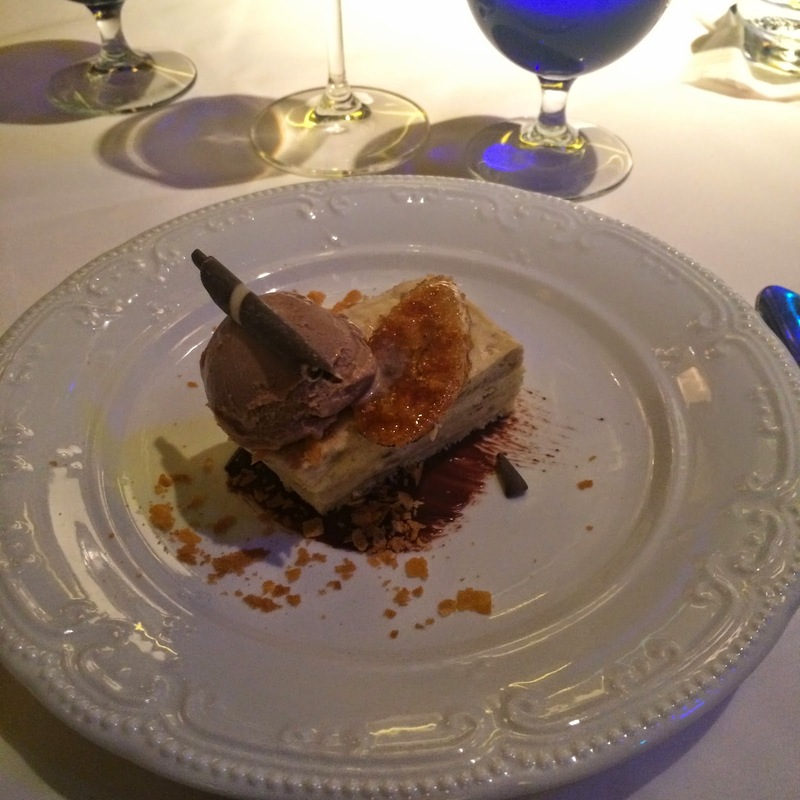 The banana cream pie at AquaKnox is not your average pie. Cut in rectangles and more thinly sliced bananas than cream filling, this dessert was complimented by caramelized bananas, rich chocolatey Guinness ice cream, and a little cookie crumble. AquaKnox doesn't have a big celebrity chef name attached to it like all of the Batali, Bastianich, Lagasse, and Keller-branded restaurants peppered throughout the Palazzo and Venetian properties. The food is just as good as any of those though and because it is a bit more under the radar than the other restaurants, it's slightly easier to get a reservation here so get in on it! 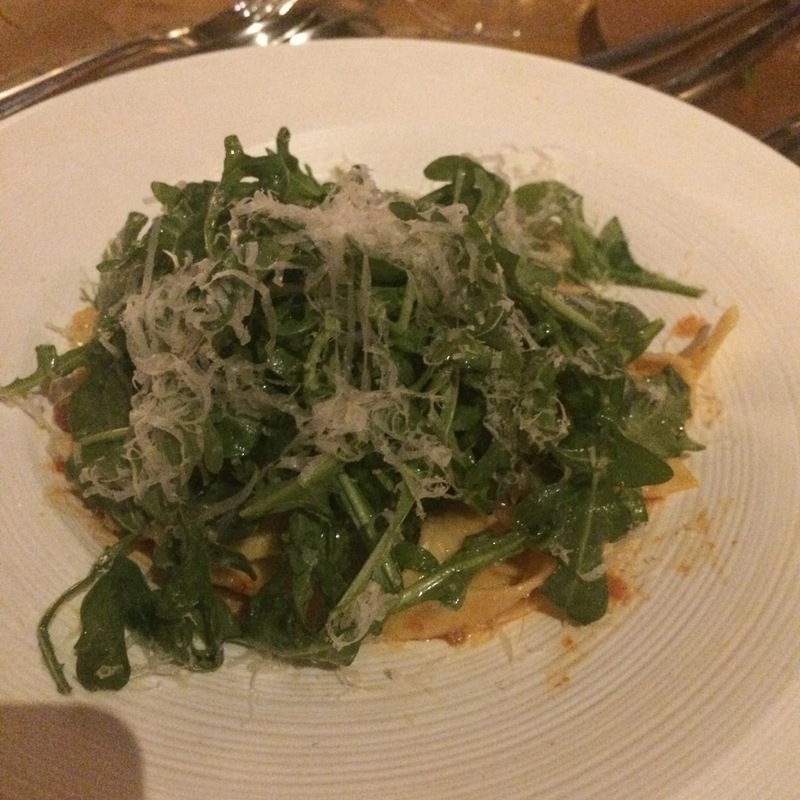 When it worked out that Alex and I would finally be in Las Vegas together with some free time to spend, I knew I wanted to dine at Giada while we were there. I am a huge fan of Giada deLaurentiis and was so thrilled at the idea of dining at her first restaurant that I made the reservation months ago-- before we had even booked our plane tickets. I'm happy to report that the experience didn't disappoint and as expected, the atmosphere, food, and service was flawless. Before I tell you more, let me say that the one thing that took me by surprise about Giada was the location. The Cromwell is new to the strip and was formerly Wild Bill's Gambling Hall, but has been recently renovated and reopened as The Cromwell. Truthfully, even after the update the casino is kind of a dump and I was surprised to walk through this cheaply done space up to Giada's impeccably designed restaurant. Don't let this deter you from eating at Giada, but just don't be surprised when you walk in... I thought we were in the wrong place! Now back to Giada Vegas. Like the menu, the restaurant has a very California feel. The palate is a lot of warm colors and earth tones and beautiful material combinations: stone, rattan, wood, and leather. Upon walking in, you're greeted by an expansive open kitchen and antipasti bar showcasing that day's antipasti options. Huge operable windows open on to the strip and the lounge areas and dim lighting make you feel like you're sitting on the deck of some fabulous southern California home. It's upscale, but the atmosphere is inviting new comfortable. Giada offers a prix fixe tasting menu (complete with souvenir menu and a visit from the amazing looking dessert cart) or a vast a la carte menu, which is what Alex and I decided on. The meal began with the house selection of breads, which right away let me know it was going to be a good meal. 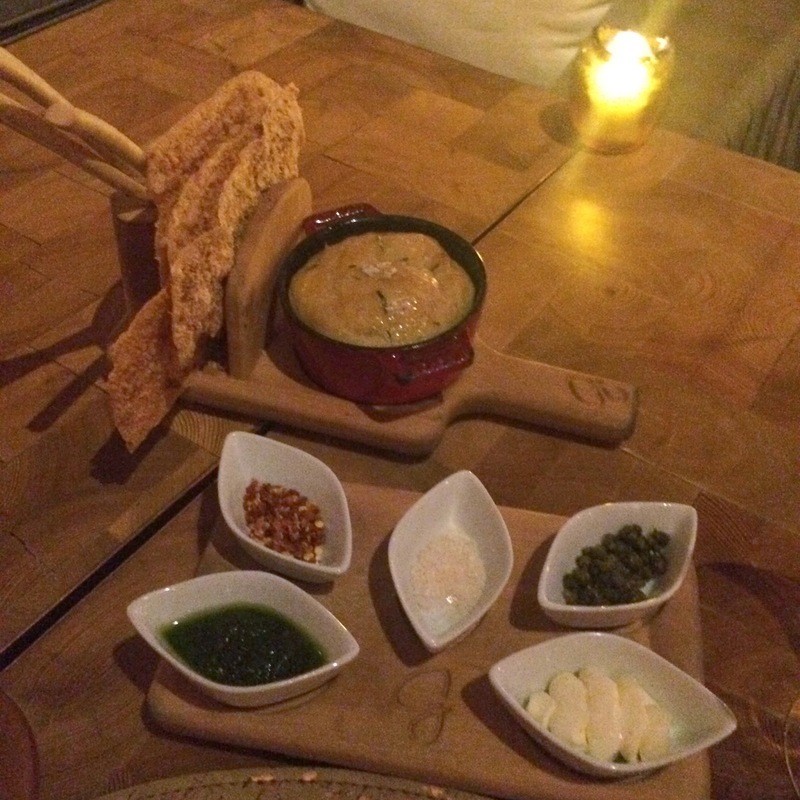 Paper thin Parmesan crisps, crunchy breadsticks, and a tiny crock of warm freshly baked rosemary focaccia arrived along with a board of toppings that included fresh pesto, lemon mascarpone butter, briny capers, red pepper flakes, and pink salt. The whole thing was such a fun twist on the standard bread basket and the warm focaccia and the lemon mascarpone butter were out of this world. To begin our meal we picked two items to share-- the first being one of our favorites: bacon-wrapped dates. These dates were each stuffed with spicy Italian sausage, wrapped in a thin slice of bacon, and finished off with a little Gorgonzola cream. These little bites were a perfect starter and a perfectly simple combination of flavors: salty bacon, sweet dates, spicy sausage, and tangy funky blue cheese. Next up, we shared the artichoke arancini. I love arancini and Giada's menu offers three varieties of these tasty fried rice balls: a meaty Italian sausage version, a decadent lobster arancini, and the vegetarian option that we ordered. The artichoke flavor was subtle and the arancini (shaped like squares, not balls at Giada) were lightly breaded and perfectly crispy, but not heavy or greasy. They were served with a little marinara on the side for dipping. For entrees, I was torn between two pasta dishes and asked our waiter for his suggestion. He let us know that the lemon spaghetti was one of Giada's signature dishes, so I went with that one. It was delicious and exactly what you'd expect from Giada's food: simple flavorful Italian food with California flair. Al dente spaghetti was tossed in a light and creamy lemon sauce thickened with fresh Parmesan and a little mascarpone. It was served with two large grilled shrimp and I absolutely loved it. The flavors were simple and flawless. Alex ordered the pappardelle with pork ragu for his main course. It was a classic dish that didn't disappoint with a thick flavorful tomato sauce filled with chunks of slow cooked tender pork over perfectly cooked pasta. We also shared a side of the grilled broccoli rabe. 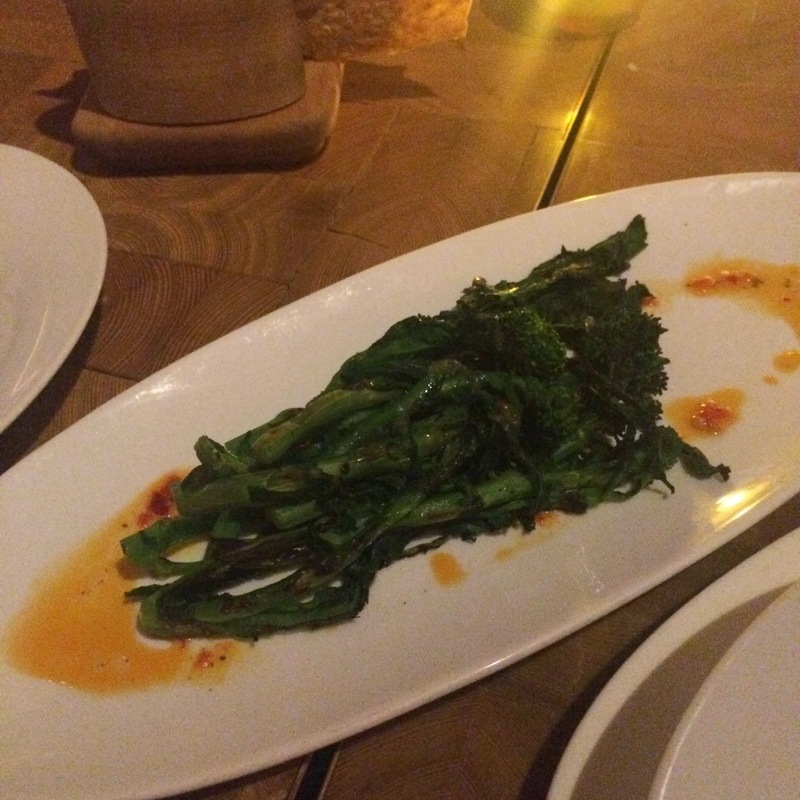 I loved the smoky charred flavor of the grilled broccoli rabe and it was dressed with a light and spicy chili vinaigrette. That was a lot of food and we we were pretty close to full, but both wanted to try something sweet before we left. 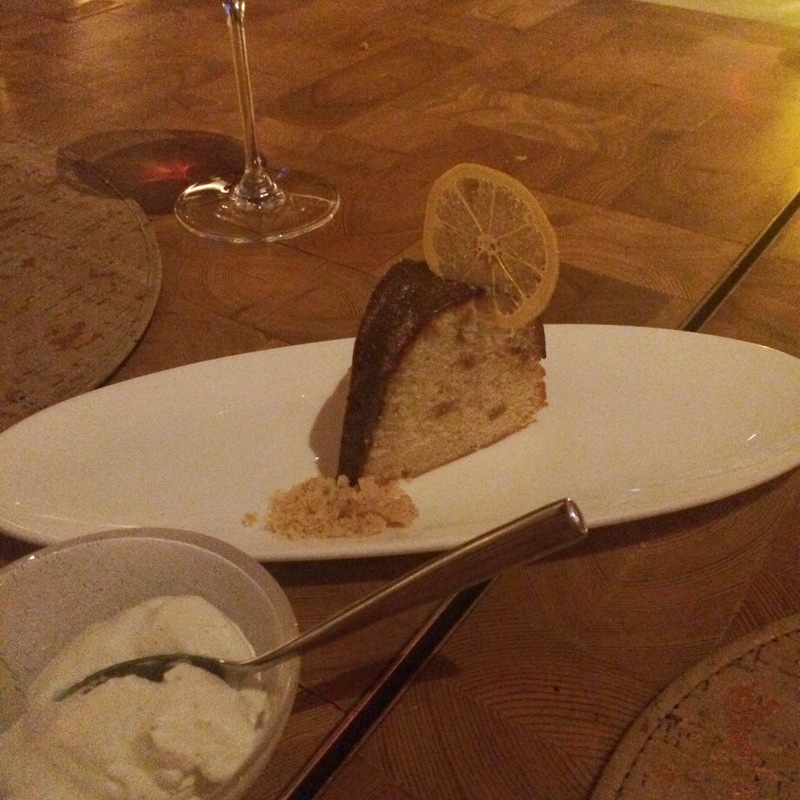 We decided to share an item on the dessert menu and settled on the lemon bunt cake. The cake was sweet with bright lemon flavor and it was surprisingly light for a bundt cake, which can often be super dense. The cake was topped with a thin layer of dark chocolate icing and a candied lemon slice with a little sweet Chantilly cream on the side. I love that sweet chocolate and start lemon flavor combination and it was a sweet end to a delicious meal.